Let’s say you’re building a boat in which you’re planning to transport two of every animal you can get your hands on. Are you going to build it out of twigs and pine needles? No, you are not. You’re going to construct that ship out of structural steel. Now, let’s imagine you’re going to load pulled pork, thick-cut bacon, barbecue sauce, horseradish, and pickled jalapenos on a biscuit (The Babe, $11). Clearly, a light, airy biscuit two inches across and three inches high just won’t do. This situation requires a Dwayne ‘The Rock’ Johnson of biscuits, as broad as it is solid. I’m talking the kind of biscuit that if you squeezed it into a greasy ball and threw it at someone, it would hurt. 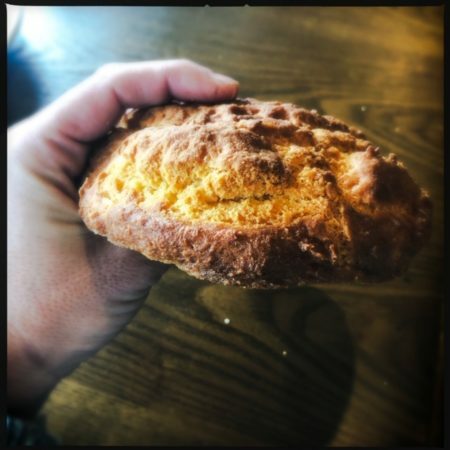 Behold, the vicious biscuit: A big, buttery, perhaps even bulletproof colossus of dense dough perfect for escorting two of every animal into your mouth. 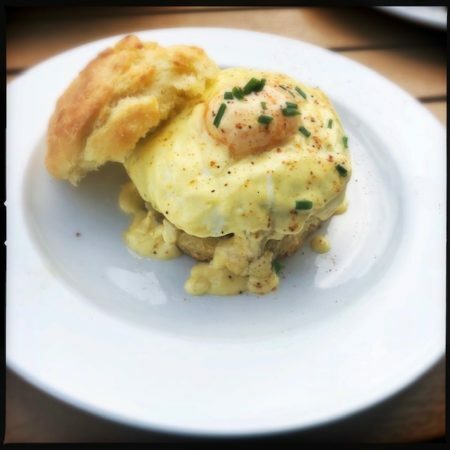 Or, in the case of the Crab Benny ($14) a large, meaty crab cake, fried slice of green tomato, sunny-side up egg, and hollandaise sauce. Generous in both size and seafood, the crabcake alone is worth the price of admission. Then there’s the green tomato, which seems to have been cooked prior to battering. This renders it more tender and sweet than the usual offering, a welcome improvement that complements rather than competes. Topped with a runny egg and rich hollandaise, attempting it as a handheld will probably result in wearing some of it home. But, hey, it’s a look. 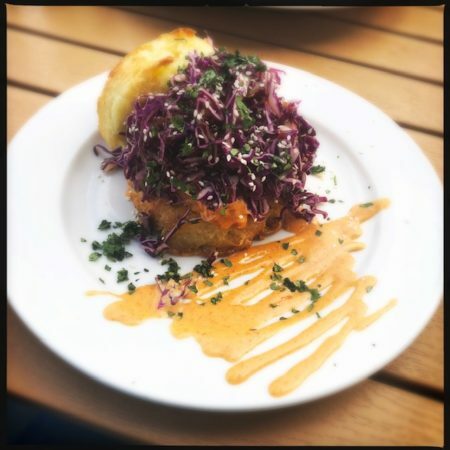 While the Bird and the Belgian ($12) isn’t anything new, Vicious Biscuit’s take on the Southern classic pairs a fried boneless chicken breast with a sweet potato biscuit batter-based waffle. Rather dense with a light cinnamon flavor, it makes for an acceptable waffle, helped along by the accompanying maple syrup, honey butter, and apple pie jam. The star of the show, however, is the chicken, where each bite is at once crispy, crunchy, and wonderfully juicy. A sampling of sides was also in order: Vicious breakfast potatoes ($3), Palmetto Farms stone-ground grits ($3), and a gluten-free biscuit ($3), which I would rate as dreadful, better, and best, in that order. 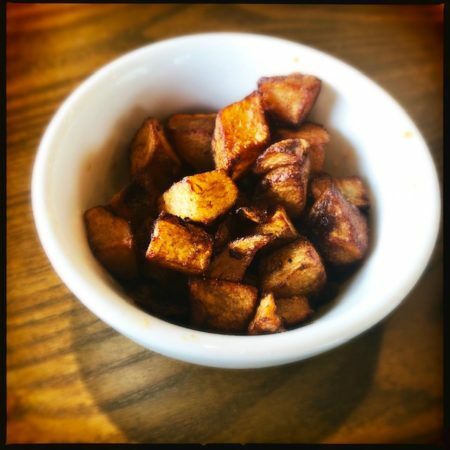 For their part, the Vicious breakfast potatoes are remorseless. Dark and greasy, the cubed bits of lukewarm tuber look and taste like they were made yesterday and have been languishing under a heat lamp ever since. Hard pass. The grits, meanwhile — even without the added cheese ($1) — are extremely rich and intensely creamy. If you’re looking to pamper your inner Marie Antoinette, this ought to do it. It’s good to see a gluten-free biscuit in the mix. A little bit sweet, and simultaneously gritty and spongy — think the texture of cornbread — there’s no mistaking it for the wheat-based version, but the rich flavor is there. Extra points for pricing it in tune with the others. 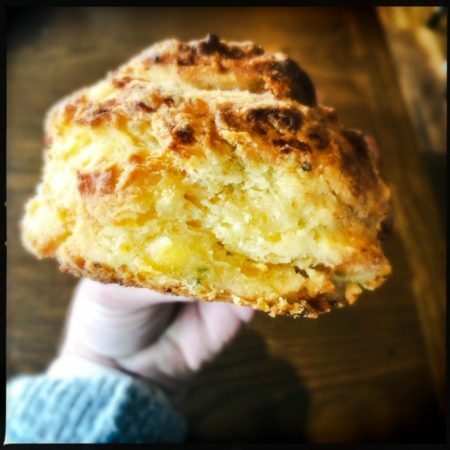 Vicious Biscuit is fast-casual in concept, meaning you order at the counter, take a number, and wait for your food to arrive. Counter service is friendly and accommodating, and the folks bringing out the piping hot food are equally cheerful. Previously Boulevard Diner (and before that, a Dairy Queen) the space is bright, open, and noisy. There’s a serve-yourself jam and butter bar, which is also home to the coffee fixings. Along with fresh-squeezed orange and grapefruit juices ($4/$6), there are a smattering of cocktails ($8), and mimosas ($6 glass/$17 carafe), all of which utilize the same fresh citrus squeezins’. 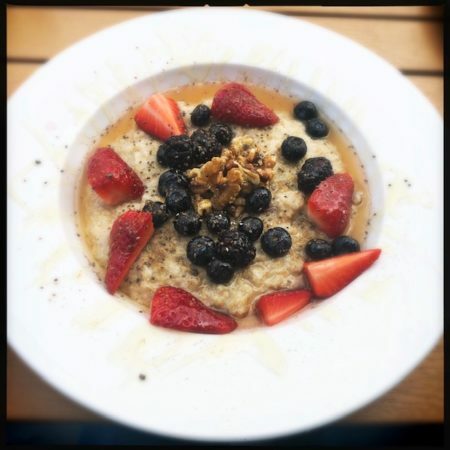 For those less biscuit inclined, the Oatmeal Power Bowl ($7) features a bowl of proprietary ‘signature Vicious oat blend,’ which tastes like … oatmeal. It’s dotted with some super fresh strawberries, blueberries, and blackberries, plus a handful of raw walnuts and a dusting of chia seeds. 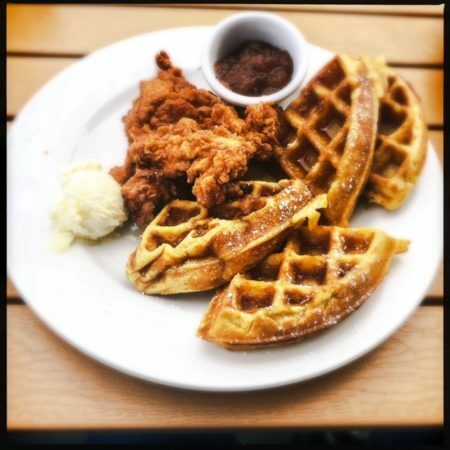 Unfortunately, it was also drowning in a deluge of ‘house honey’ which in appearance, taste, and viscosity is identical to the cinnamon-y maple syrup served with the waffles. Huh. Regardless, and whether billed as syrup, honey, or something in between, I’d highly recommend asking for it on the side. On that note, should you find yourself on Coleman Boulevard with a hankering for hedonism, now you know. Thanks to quality ingredients, generous portion sizes, and colossal buttery biscuits, Vicious Biscuit is already enjoying long lines. Perhaps use that time to stretch, loosen your belt, and prepare your gut for the coming storm. They don’t call it vicious for nothing.